This picturesque 19th century waterside community is an ideal setting to provide a fun learning experience for almost any youth group. Let our program staff work closely with your leaders to design a program that can teach your youth valuable new skills relating to pioneer life. 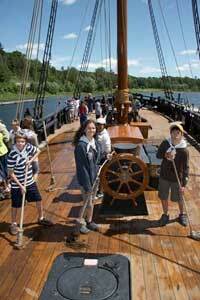 Learning about Discovery Harbour is made fun by involving your group in historical hands-on activities on the site. Combine your tour with in-depth workshops including rope-work, pioneer life and surviving in the back woods of Upper Canada. For more information on our Spring, Summer and Fall events and programs happening at Discovery Harbour, call our Tour Coordinator today on (705) 528-7694 or enquire online.